This is just so adorable, Cebelica! I had to stop by and leave some love for you. So many beautiful details. OMG this is so fabulous! What a fun creation! Thanks so much for joining in the fun at our Double D ‘Baby It’s Cold Outside (winter)’ challenge! We hope you’ll come back often. Hello friend! What a fun snowman, and you always do such a great job with texture and dimension! So glad you were able to play along with us at Words 2 Craft By. Merry Christmas and Happy 2018! Beautiful card Cebelica. Merry Christmas! Oh he is fantastic, especially topped with that little chick, too cute! 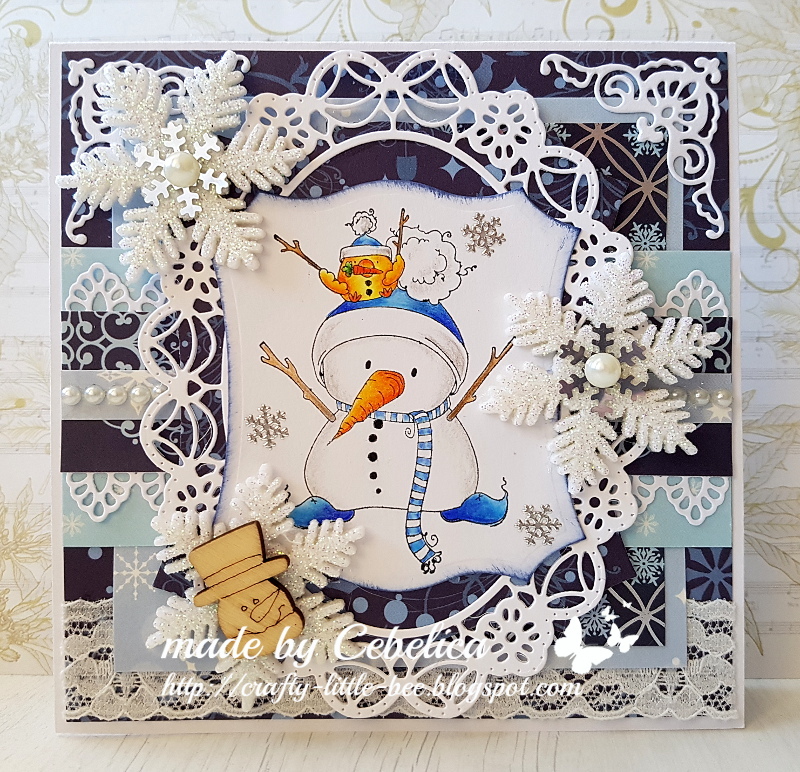 Great design and I love those beautiful dies, the frame and snowflakes--wow! 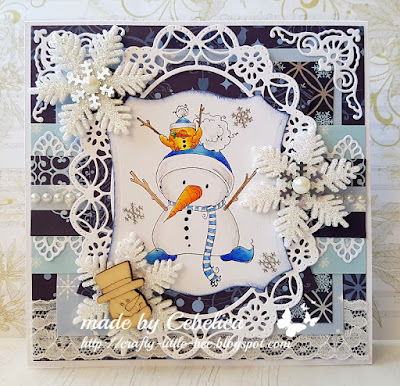 Thanks so much for playing along with us at The Double D Challenge Blog, Baby It's Cold Outside (WINTER), Donna, DT Member. Merry Merry! Lovely work! Really pretty framing of your cute snowman. You've set such a beautiful scene for your darling snowman! I adore every magical bit of it. The snow details are so pretty in contrast with the darker background. You put a lot of heart into this very creative card and it looks like you had tons of fun with it. Thanks so much for sharing with us at Double D! That is the cutest snowman! 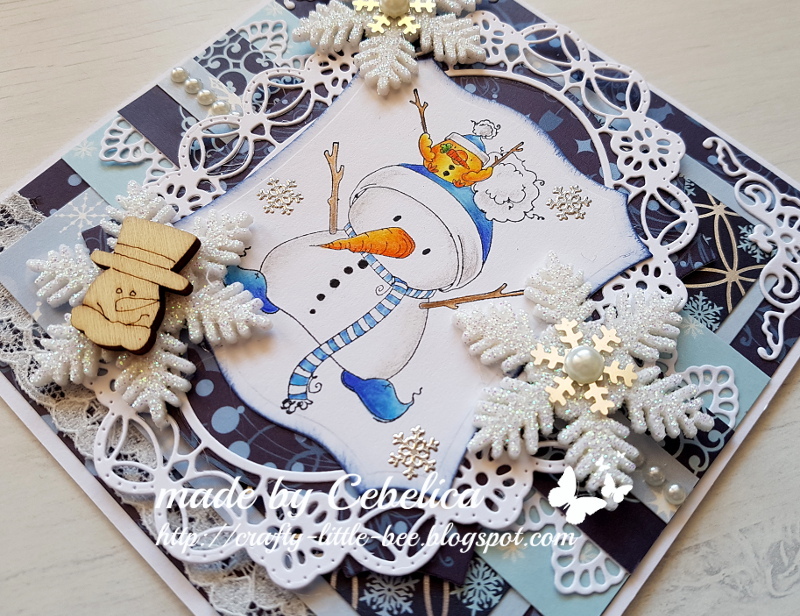 Thanks for sharing your lovely card with us at CraftyHazelnut’s Patterned Paper challenge! Wow Cebelica! What an amazing card with such perfect layers and embellishments. Thank you for joining us at 7 Kids!